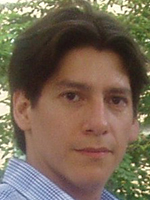 Roberto Samaniego is Professor of Economics and International Affairs. He received his PhD in Economics from the University of Pennsylvania in 2001, joining the faculty of The George Washington University in September of that year. He also holds a BA in Economics from Princeton University. Professor Samaniego has published articles in a number of leading economics journals, including the American Economic Review, the Journal of Monetary Economics, the Journal of Money, Credit and Banking and the Journal of Economic Growth. His primary professional interests are in the areas of macroeconomics and economic growth. He has focused on understanding the relationship between technical progress, entrepreneurship and institutions.